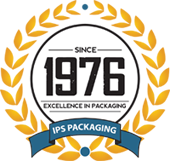 Our company has been in the business of providing packaging supplies and solutions for over 30 years. 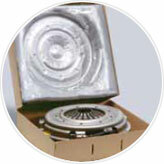 Foam in place Systems offers excellent customer service and top quality foam-packaging products. Our main goal is to provide you with the most customer-friendly, innovative foam packaging solution on the market. With better foam packing technology, we are one step ahead of the competition with our five degrees of intelligent packaging. Another benefit of our Foam in place products is The Five Degrees of better packaging intelli-gence that comes with each product. These five degrees separate us from the competition by en-suring accountability, increasing technology and providing quick resolutions to your company's needs. The intelligence of telemetry enables preventative maintenance 24 hours a day, seven days a week. By providing an automatic ordering option and simple connectivity, this Foam in place packaging system enables greater efficiency; therefore, reducing your overall raw material costs. The telemetry system automatically collects, monitors and measures liquid foam and film usage, pressure, temperature and other system maintenance issues. It will then automatically contact a service technician to make sure your machine gets everything it needs to be up and running at all times. The simple, automatic, intelligent process of bar coding increases your productivity, improves your protection and reduces your waste. By monitoring your liquid foam and film, the bar-coding system provides the right amount of liquid foam for each product every time. Each product receives an individual bar code assigned to identify it. From there, the bar code data will be programmed to match the pack-out requirements of that individual product. With the scan of a bar code, the Foam in place system will dispense the exact amount of liquid foam and film needed every time. A system created for the operator, our Foam in place systems design is meant to provide user-friendly features. With user-friendly, programmable bag makers, user-friendly hand-held dispenser technology, our Foam in place systems are easy to use for any operator. The ergonomics, advanced software and lightweight chemical pumps of our Foam in place systems all create a machine that is made from intelligent design. Our Foam in place systems are created to provide top-notch service to our customers. With systems made for the user in mind, we offer quick turn-around that reduces downtime, increases productivity and provides tools and parts included with the equipment lease at no additional cost. A customized program tailored to your specific needs, the Advantage Program is an excellent option that requires no up-front capital investment. This program is made to be flexible, so it can adapt to your changing business needs as time progresses. Advantages of the program include: installation, training and on-going support, a lifetime warranty on parts and equipment, ongoing expert consultation for changes in your packaging needs and other exciting benefits. Be sure to ask one of our customer service representatives about the Advantage Program. Foam in place protective packaging has been around for more than 30 years, but never has there been a solution quite like this. Foam in place systems transform mature technology into an intel-ligent, cost-effective approach to foam packaging. Foam in place polyurethane is molded in real-time by combining two liquid foams in a pre-fabricated mold, high-density polyethylene bag or film. The mixture expands rapidly around the product being protected, creating a custom protective shell. Our Foam in place is a time-tested, field-proven packaging alternative designed to help the busiest, high-volume warehouses, distri-bution centers and manufacturing facilities work simpler and smarter. Our systems feature the most cost-effective, time-efficient Foam in place packaging technology in the industry delivering the highest degree of packaging protection across multiple applications, fast. Ensure consistent cushioning for your products with pre-molded foam. You will have custo-mized, engineered, pre-molding that is perfectly fitted to your products for maximum protection. 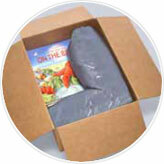 In five quick steps the customized molded foam is ready for your packaging needs. 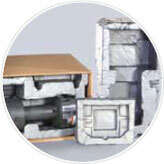 The Smart-MOLD product line features these types of applications for protective packaging. The foam-in-bag concept is simple. By choosing the size bag you want from six sizes available, you then dispense liquid foam in the bag. Allow the foam in the bag to mold around the product being packaged, transforming the bag into a "shell" that provides the ultimate protection. 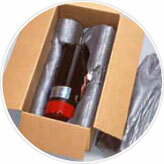 The SmartBAGGER foam-in-bag packaging system is ideal for this type of product application. With six standard bag sizes available, customers simply choose the size they want. Liquid foam is then automatically dispensed inside the bag, transforming into a shell around the product for optimal protection. Both product lines, the SmartSHOT and SmartSHOT Hybrid, are capable of this Foam in place application.